Teeth can fall out due to a number of reason. Sometimes a tooth is knocked out due to an accident. Sometimes a cavity is left to progress too far and a tooth is lost. Sometimes our adult teeth do not all grow in, leaving gaps in our smile. In any case, when a tooth or several consecutive teeth are missing, but are located between otherwise strong and healthy teeth, a bridge can be used to fill the gaps. 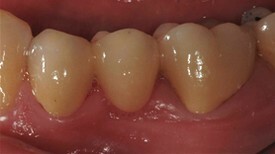 A bridge is essentially a replacement tooth connected by caps on either side, forming a “bridge.” False teeth (called pontics) are bonded together, held together on the ends by two caps. 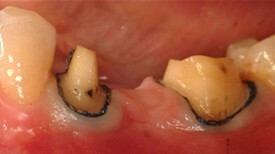 The caps are placed over your remaining teeth, with the false teeth filling the gaps in between. Since we here at CCIND only use porcelain to create our fixed bridges, the bridges can be constructed to match the color, size, and shape of your current teeth, to create a natural-looking smile, free from distracting gaps. Removable bridges are sometimes used to people who want the option of taking their bridges out on occasion. This option, however, is usually only recommended for people who plan to obtain dental implants in the future, or for child actors or models, who need to fill in missing baby teeth until their adult teeth grow in. For the average person, however, who wants to re-do their natural smile, our porcelain fixed bridges may be the best option.